Apparel, t-shirts, sweatshirts, hoodies, iron ons, etc. Now in it’s 9th year, the Brunswick Fall Classic has been the largest soccer tournament in North East Ohio for the past few years. With 200 teams converging from all over Ohio, as well as surrounding states, they come to compete at various field locations in and around Brunswick. It takes a tremendous amount of organization to handle the influx of thousands of soccer players for the November 2 and 3, as well as their families who come to cheer them on, and the logistics of having hundreds of games run smoothly. This is where Ed McCrady, owner of PODS of Northeast Ohio, was able to step in. Ed donated 4 PODS brand storage containers so the tournament staff and volunteers would have a place to store the necessary equipment (golf carts), awards (trophies for championship games), cones (for parking), tables and chairs (for the main tent) and any extra needs for the soccer complex and requirements for the soccer tournament. The Brunswick Classic Tournament has also teamed up with the Brunswick Food Pantry. They hope the teams will consider this great opportunity to learn the importance of giving back by donating items to the Brunswick Food Pantry. With 200 teams participating, they can Fill the Shelves for the hungry families of the community! 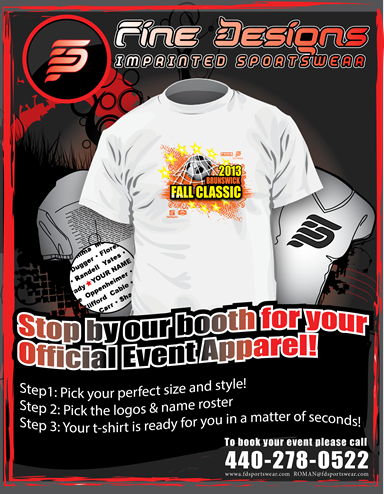 Items will be collected per team and handled by the coach at the Fall Classic registration night on November 1 or brought to the main tent during the tournament. For more information about the Brunswick Fall Classic or their Fill the Shelves event, go to their website at: www.eteamz.com/brunswicksoccerasc. The Brunswick Soccer Association is a youth travel soccer organization for ages U8 through U14, for both boys and girls. Their address is: P.O. Box 633, Brunswick, Ohio, 44212. Founded in 1998, PODS currently provides moving and storage services to more than 240 million consumers in 48 U.S. states, Canada, Australia and soon the United Kingdom through its company-owned and independent franchise network. To date, the PODS network has completed more than 250,000 long-distance relocations, exceeded 1 million deliveries and has more than 140,000 PODS® containers in service. PODS® secure containers are constructed of a steel frame and are available in three sizes: approximately 8-by-7-by-7 feet, 8-by-8-by-12 feet and 8-by-8-by-16 feet. The 12- foot and 16-foot containers have been tested to withstand winds of more than 110-mph when partially loaded. and other areas. You can also join us at www.facebook.com/PODSNortheastOhio or www.twitter.com/podcleveland. Contact Marc Leyerle for your sporting event(s) awards needs.